Sitecore DMS setup tips. One of the major strengths of Sitecore CMS compared to other enterprise CMS solutions is the ability to easily personalise content using DMS (Digital Marketing System). A common scenario involves setting up DMS for the first time, so that as a developer you can get confidence in using Sitecore DMS, and more importantly to show your marketing team how it works in practise. Setup a new profile in the content editor and work out the basic settings. 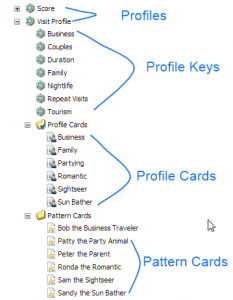 Create profile cards, that can be used to easily tag pages with set profile key scores. To test DMS you must use the Sitecore Experience explorer on the Sitecore marketplace, this is a must. see Sitecore Experience explorer here. Having setup the DMS, tagged the pages and tested the site using the Experience Explorere the personalisation should work. If it does not then you probably need to output the Profile Key Scores and Pattern matches in a real (not logged in) test. The below code can be added to a user control to output these values (Sitecore Profile Key Values and Pattern Matches) for the current user in the pages meta.